(Bloomberg) -- Tracht, the traditional Alpine garments that include lederhosen and dirndls, can be seen as many things: a vestige of Germany and Austria’s conservative elite, a reminder of the World War II era, or icons of beer-slinging days in the Oktoberfest tents. Rarely have they been seen as emblems of high fashion. But today, tracht is being reclaimed by young, stylish Germans—fueled by haute couturiers whose origins and inspirations stretch well beyond Germany. These designers are experimenting with softer silhouettes, ladies’ lederhosen, and textiles from around the world, attracting a global audience that includes everyone from Mila Kunis and Ashton Kutcher to the Kardashians and Munich’s fashion-forward set. 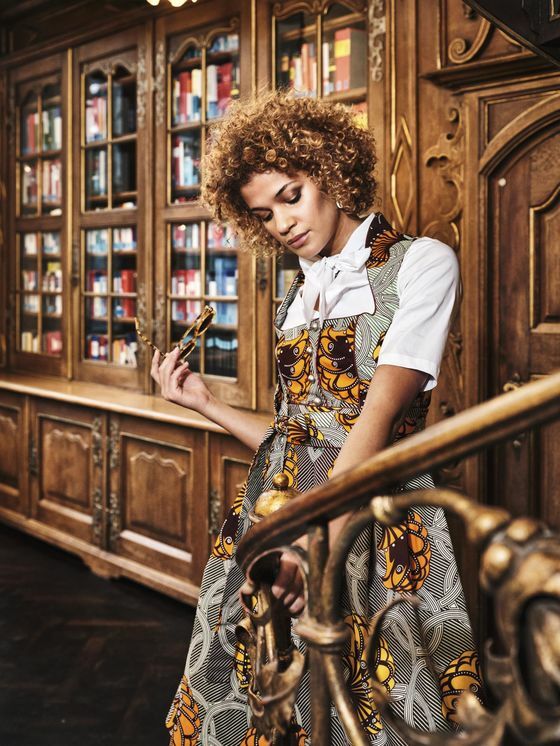 “Bavaria is a little, little kingdom,” says Rahmee Wetterich, one half of the design duo behind the African-fusion dirndl label Noh Nee. “But these days, it’s not just Bavarian.” Instead, she says, the region has become a melting pot in which large waves of immigration continually shape and reshape local culture. Lola Paltinger, the godmother of modern dirndl, focuses less on global influence and more on red carpet-worthy glamour. “I liked the tracht, but it was very old, sometimes a little bit boring,” she says, recalling her initial inspiration as a fashion school student in the 1980s. “I thought, why don’t you wear a glittering blouse with the leather trousers, why not rhinestones, hand-painted velvet?” Three decades in business later, her higher-end creations—such as the multi-piece “Marie” jacquard dirndl—sell for a cool €3,500 ($3,964). Couture dirndls have been coming up gradually as way to reclaim the national dress, not just from its politically-charged past but also from the lowbrow, made-in-China creations that hit shelves in the run-up to the fall festival. But even if tourists are driving the market for €50 kitsch pieces, they’re also spurring demand for the luxury versions; Paltinger says her sales have tripled in the last decade, concurrent with a rapid spike in international visits to Bavaria. What’s more, she counts foreign customers at around 30 percent of her clientele—including celebrity fans such as Kim Kardashian, Paris Hilton, and Salma Hayek. Some of that early international buzz may have been helped by the late Karl Lagerfeld, who released a capsule collection of Bavarian-punk dirndls just before Octoberfest in 2013, but it’s been catalyzed more recently by a spate of innovative up-and-comers. Noh Nee, the label founded by Wetterich and her sister, Marie Darouiche, might be the clearest example of that idea, though its pieces are primarily sold at proprietary boutiques. It’s run by two sisters who immigrated to Germany from Cameroon as children. True to their heritage, their styles use vibrant West African Kente fabrics and traditional-feeling silhouettes. How they’ve done that aligns with a concept nationally referred to as heimat, a fondness for homegrown culture that translates as patriotism but not necessarily with far-right associations. As a result, tracht are becoming as ubiquitous at weddings, nightclubs, and even workplaces as they are in the Oktoberfest tents—at least in Bavaria.